How shall we respond to alarming mental health indicators in fighting ranks? HIGH PTSD RATES. Top Army leaders are speaking out about the toll the Iraq War is taking on troops who return repeatedly for tours of duty. Nearly one third of soldiers who return from a third tour of duty evidence PTSD (post-traumatic stress disorders) and other war-related mental health issues. The implications are stark, especially in the face of a "stay the course" policy and recommendation of General Petraeus that troop levels not be reduced. But in a meeting with Mr. Bush late last month in advance of General Petraeus’s testimony, the Joint Chiefs of Staff expressed deep concern about stress on the force, senior Defense Department and military officials said. Among the 513,000 active-duty soldiers who have served in Iraq since the invasion of 2003, more than 197,000 have deployed more than once, and more than 53,000 have deployed three or more times, according to a separate set of statistics provided this week by Army personnel officers. The percentage of troops sent back to Iraq for repeat deployments would have to increase in the months ahead. The Army study of mental health showed that 27 percent of noncommissioned officers — a critically important group — on their third or fourth tour exhibited symptoms commonly referred to as post-traumatic stress disorders. That figure is far higher than the roughly 12 percent who exhibit those symptoms after one tour and the 18.5 percent who develop the disorders after a second deployment, according to the study, which was conducted by the Army surgeon general’s Mental Health Advisory Team. The Army and the rest of the service chiefs have endorsed General Petraeus’s recommendations for continued high troop levels in Iraq. 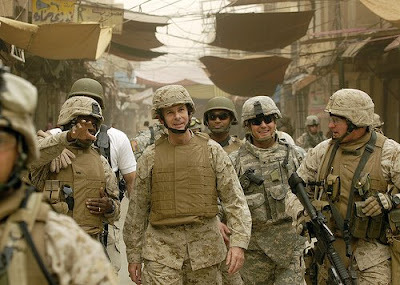 But Adm. Mike Mullen, chairman of the Joint Chiefs, and Gen. George W. Casey Jr., the Army chief of staff, and their top deputies also have warned that the war in Iraq should not be permitted to inflict an unacceptable toll on the military as a whole. Beyond the Army, members of the Joint Chiefs have also told the president that the continued troop commitment to Iraq means that there is a significant level of risk should another crisis erupt elsewhere in the world. Any mission could be carried out successfully, the chiefs believe, but the operation would be slower, longer and costlier in lives and equipment than if the armed forces were not so strained. HOW SHALL I PRAY? I'm wondering how I might, as my Carmelite sisters over on North Cold Springs Road would put it, "pray this news" (see the "Pray the News" website)? For whom, for what should I pray? Why should I care and what expression might my care take? THE PRINCIPALITY OF MILITARISM. This is how I begin to frame my prayer: My heart goes out to all who have been drawn into this war and into the spirit of militarism, with its idolatrous absolutes. Some have been able to serve and still maintain a heart of peace, resisting the principality of militarism. Others, perhaps unwittingly, have immersed themselves in the very spirit of militarism and follow its skewed moral compass. But all--all--are victims of war, though not all equally so. THESE SOLDIERS ARE PROPHETS TO US. At one level, these soldiers who experience flashbacks, depression, irrational irritability, anxiety, anger, etc. speak to us and to the world in a prophetic voice. Together they shout to us that war's manner of resolving conflicts exacts a dehumanizing toll--even among the most well-trained, equipped and resourced--and that we must find a better way. Profoundly, war does not work. RESPOND TO WOUNDED SOLDIERS. At another level, these wounded soldiers call out to us to respond with compassion and healing actions at every possible level. This, too, is a prophetic call they make. They beckon to us to enter into their suffering with understanding and solidarity so as to be with them, identify with them, to take on their guilt, shame, pain, unanswerable questions, and anxiety, and, in hope, together to move toward healing.